Don't like going to the eye doctor? Well, it used to be a whole lot worse, as this collection of shocking photos of ophthalmology from the 19th and 20th centuries show. The images are courtesy of New York ophthalmologist Dr. Stanley B. Burns who has one of the world's largest collections of early medical photography. Modern ophthalmology has made huge gains, like curing cataracts, says Burns. But that's not all. Check out these 14 images and be grateful for progress of science. In the 19th Century, the cancer now called basal cell carcinoma was known as rodent cancer. That's because patients with advanced cases, like this woman treated in London in the mid-1800s, looked as if their flesh had been gnawed away by rats. This photograph was published in 1867 in one of the first medical textbooks, "Rodent Cancer." It was written by Dr. Charles Hewitt Moore (1821-1870). Until the late 1800s, cancerous growths were often left untreated until they were very advanced, as shown in this 1906 photograph. Surgery was a last, desperate resort - after eye patches no longer sufficed. There hasn't been a case of smallpox in the U.S. since 1949. But between 1900 and 1979, an estimated 300 million to 500 million around the world died of the disease. This photo shows a man infected during an 1881 smallpox epidemic. Before the days of antibiotics, sinusitis and minor respiratory infections could lead to abscesses of the eyes. This 1908 photograph shows a man whose abscess has caused his eye to shift downward. This photograph first appeared in 1871 in the first medical photographic journal. It shows a patient with von Recklinghausen's disease, a disfiguring hereditary disease now known as neurofibromatosis. There is still no cure for the disease. Patients often have the "fibromas" surgically removed - unless they are too big or too numerous to remove. Now rare, the bacterial infection known as impetigo was common in the 19th Century. This photo appeared in 1865 in an English textbook on skin disorders. It shows a child with pustules typical of the disease. Impetigo is typically seen in children, often following a cut, abrasion, or insect bite. Hyperthyroidism - the same disorder that causes goiters - can also cause bulging eyes, as shown in this 1908 photograph. As the eyes protrude, the tend to dry out, sometimes resulting in scarring, infection, and blindness. Hyperthyroidism is also known as Grave's disease. 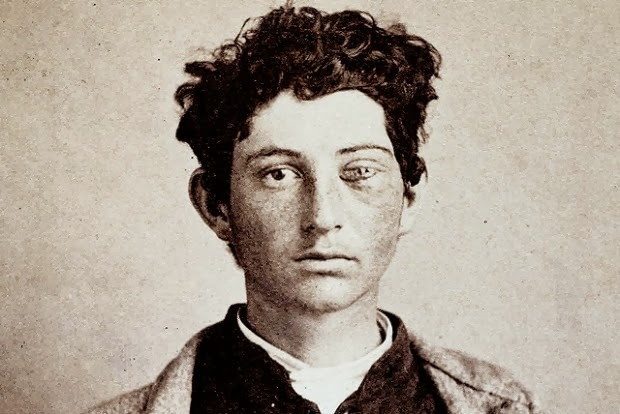 During the Civil War, an army surgeon named Dr. Reed Bontecou photographed wounded soldiers. Shown here are photos of a soldier from New York before and after his battlefield wounds to the eyes were treated. Dr. Bontecou served as surgeon in charge at Harewood U.S. Army Hospital in Washington, D.C. This 1867 photograph shows a woman with a form of leprosy known at the time as "elephantiasis des Grecs." It first appeared in a French medical text published in 1868, "Clinique photographique de l'hospital Saint-Louis." Three years later, in 1871, this dreaded disease - which affects the eyes and causes enlargement of various parts of the body - was found to be caused by a bacterium. What's the best light source for looking inside the eye? Until the end of the 1920s, when the electric "slit lamp" became widely available, candlelight was the best bet - as shown in this 1910 photograph. Examining the interior of the eye made it possible to conquer many eye diseases. Here's an early version of the phoropter, a device eye doctors and opticians used to find the correct corrective lens. The circa 1895 device shown in this photo housed a variety of lenses, including ones to treat astigmatism and to evaluate other eye problems. In 1870, a French ophthalmologist named Edouard Meyer included a series of photos in his textbook on surgery. The film of the era was too "slow" to take photos of actual operations, so he staged photos using cadavers. In this photo, a clamp holds the eye open to show where a scalpel should be positioned to remove a cataract. Today's eye surgeons can laser a hole in a patient's iris (the colored portion of the eye) in a matter of seconds. But in the late 1800s, doctors used a sharp tool to perform "iridectomy," as shown in this 1870 photograph. Iridectomy allowed the creation of an artificial pupil, restoring sight to those blinded by common infectious and inflammatory disorders. 5 responses to "Eye care in the 1800s(14 Pics)"
I can not stand to see this web. but if you have problem with your eye, please visit your doctor.